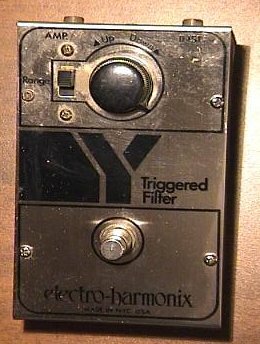 The original 1970's Electro-Harmonix Y Triggered Filter pedal can create several variations of funky tones. The pedal pictured here is a 1977 model with all original parts right down to the screws and control knob.1970s Electro Harmonix Y Pedal.Like many of the vintage Electro-Harmonix pedals this one is very straight forward in its design, operation and components. The sounds are very similar to quaky, tongue-in-cheek auto wah pedals which can seem to have a mind of their own. 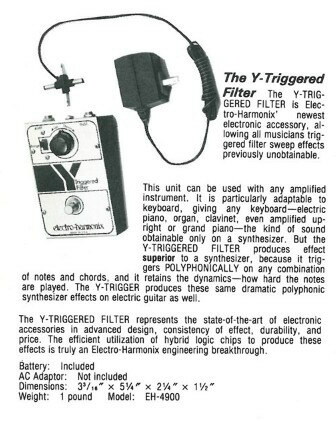 Using a wah pedal allows the guitar player a lot of freedom and control over the effect, but the auto wah feature of the triggered filter responds to the attack of the pick and responds with some very authentic sounding 1970s funk music. It can take some getting used to when playing a guitar through this pedal. The control knob allows you to select which way the sound will "move". This means you can select "Up" and you can hear the tone of the effect rise upward. The exact opposite is true if you select "Down". The range is controlled by a switch and gives you the ability to tighten up the effect for lead runs and guitar licks, or open it up wide open for some very unique rhythmic ideas. This works fantastic with funky guitar rhythms or picking single strings within arpeggio chords. These days the EH Y pedal can be hard to find, especially in the condition of this one. They were made way back when the original company was going strong and creating all kinds of experimental and wacky guitar effects pedals. And just like others from the mid-seventies time period, they can be pure analog heaven for those seeking experimental guitar sounds. While the first thought most people have is that these tones are on the funky side, they can work in other musical styles besides disco. It is also possible to get some decent sounds from it using a bass guitar too.